So far, six lawyers were sentenced range to 6 and 12 years imprisonment by #Adana 11th High Penal Court. Lawyer Fethi Ün, 70, who has represented the Erdogan’s greatest enemy Fethullah Gulen for four years (1990-1994), was sentenced 12 years prison sentence with the charge to be the member of the armed terrorist organization. Lawyer Ali Aksoy was detained on 21st July 2016; only 5 days after the failed coup attempt. Izmir 2nd High Criminal Court sentenced lawyer Ali Aksoy to 3 years imprisonment because of his press statement about “the prosecutorial misconducts” against his clients. Lawyer Aksoy has been under arrest since 2016 July. Lawyer Ali Aksoy made a press statement to disclose the actions which have the characteristics of the obstruction of justice conducted against his clients by Engin Dinç (Chair of Turkish Police Intelligence) Kudret Dikmen (Chief of Police Intelligence in Izmir) and Okan Bato (Deputy Chief Prosecutor of Izmir) in August 2014. After the 2016’s coup attempt, lawyer Mr. Aksoy was prosecuted and indicted because of above mentioned press statement (in favor of his clients) and was sentenced to 3 years with the charge of targeting public servants. Lawyer Mr. Aksoy is also on trial with faked up terror charges and up to 37 years prison sentence is being sought for him. Kayseri 4th High Penal Court sentenced lawyers HŞ and HHA 6 years 3 months prison sentence with the charge to be the member of the armed terrorist organization. One of the victim lawyer said that despite the digital forensic report presents that I have never downloaded the BYLOCK secure i-message application, the court sentenced me 6 years 3 months, I wish hell for them. As reported by the Libertarian Lawyers Platform, lawyer Gürkan İstekli who has been under police custody in Sanliurfa since 14th November was subjected torture. Lawyer Gürkan İstekli who is the member of @ohplatformu has been under police custody in Sanliurfa for 3 days. There has been a relentless campaign of arrests which has targeted fellow lawyers across the country. In 77 of Turkey’s 81 provinces, lawyers have been detained and arrested on trumped-up charges as part of criminal investigations orchestrated by the political authorities and conducted by provincial public prosecutors. 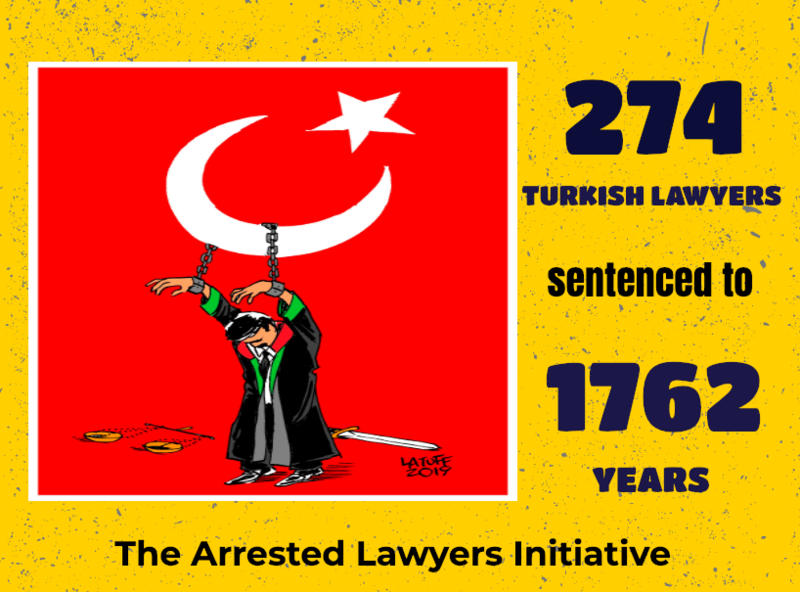 As of today, 562 lawyers have been arrested and 1438 lawyers are under prosecution, 67 lawyers were sentenced to long imprisonment. Some of the arrested lawyers were subjected torture and ill-treatment. In addition to those; Kocaeli, Niğde, Kırşehir, Kayseri İzmir High Penal Courts sentenced fellow Turkish lawyers to long imprisonments.